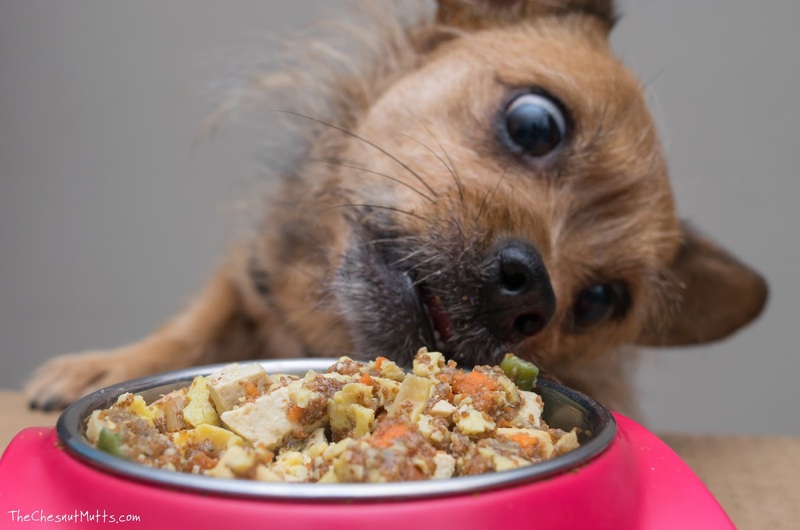 The evolution of dog food is an amazing thing: Kibble, wet/canned, raw, cooked, dehydrated, freeze-dried, and everything in between. 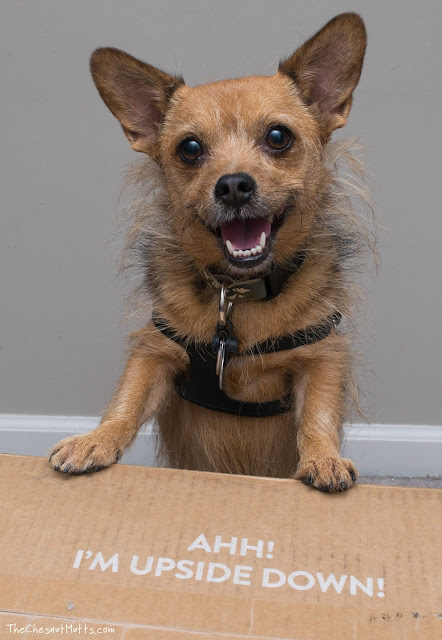 Now there is a new option for those who want to provide your dog a homemade cooked meal - and it is even preportioned and delivered to you fresh! 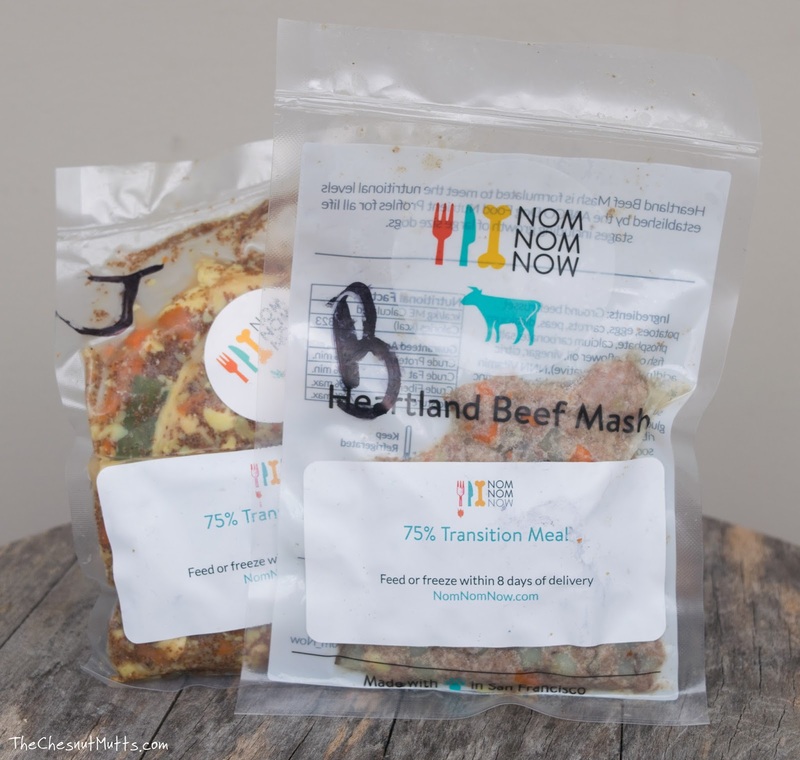 The future is here with our review of the brand NomNomNow! 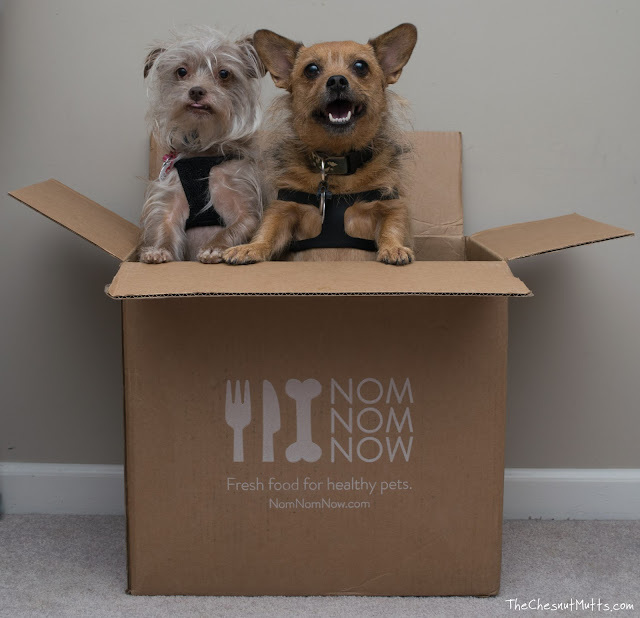 Started in 2015, the Oakland, California based company NomNomNow was built on the belief that we should feed our pets better than the commercial options out there. After cooking food for their own dogs, Zach Phillips, Alex Jarrell, and Nate Phillips started cooking for their friends and family. 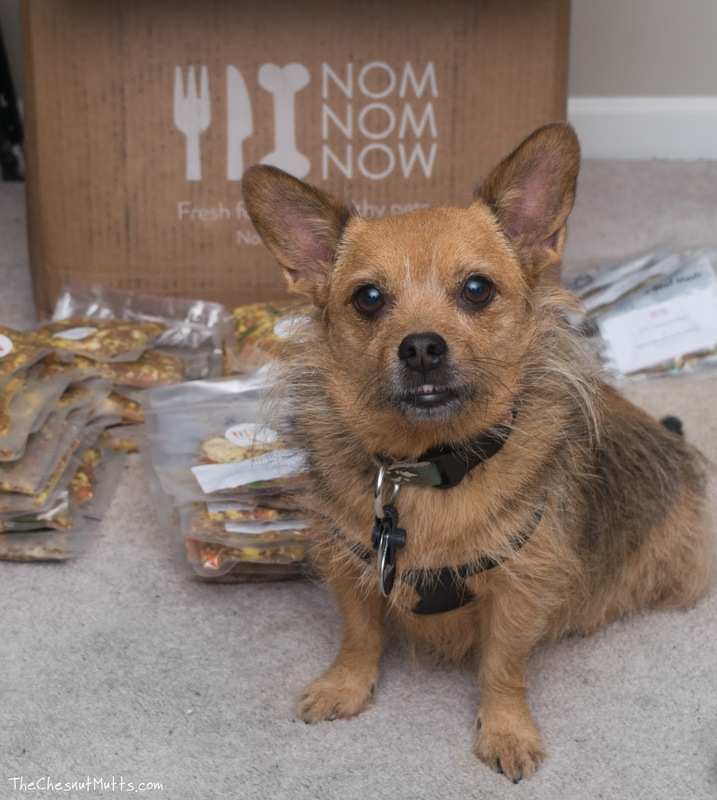 Then, the group gained the company of Dr. Justin Shmalberg, a leading expert in dog nutrition; with his help, they formulated each NomNomNow recipe to be nutritionally complete. So what makes NomNomNow different? 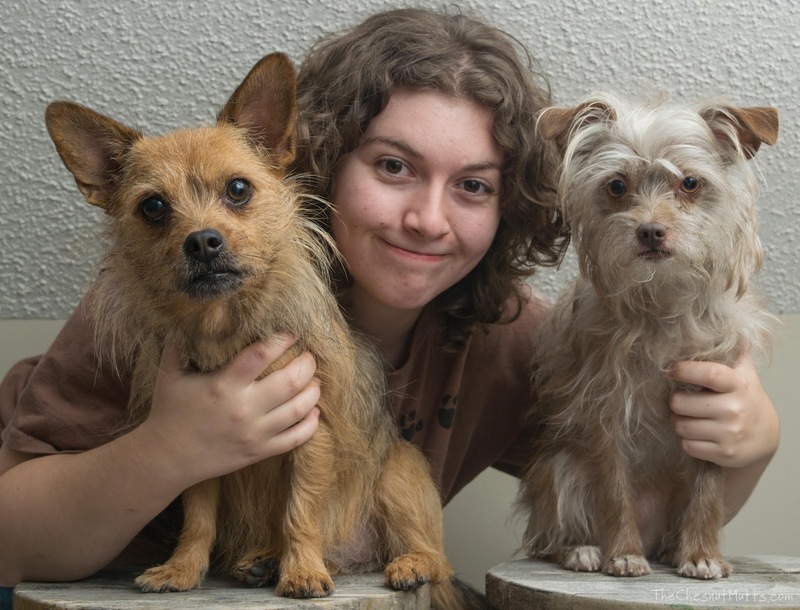 Starting at their website, you put in your dog's details: Name, age, breed, any allergies, etc. Then you pick your recipe: Heartland Beef Mash, Tasty Turkey Fare, Chicken Chow-Wow, Porkalicious Potluck, or Egg & Veggie Medley. The food is delivered to your doorstep in an insulated box with individually packaged fresh meals inside. These meals are never frozen but do come with freezer packs to keep them cold. 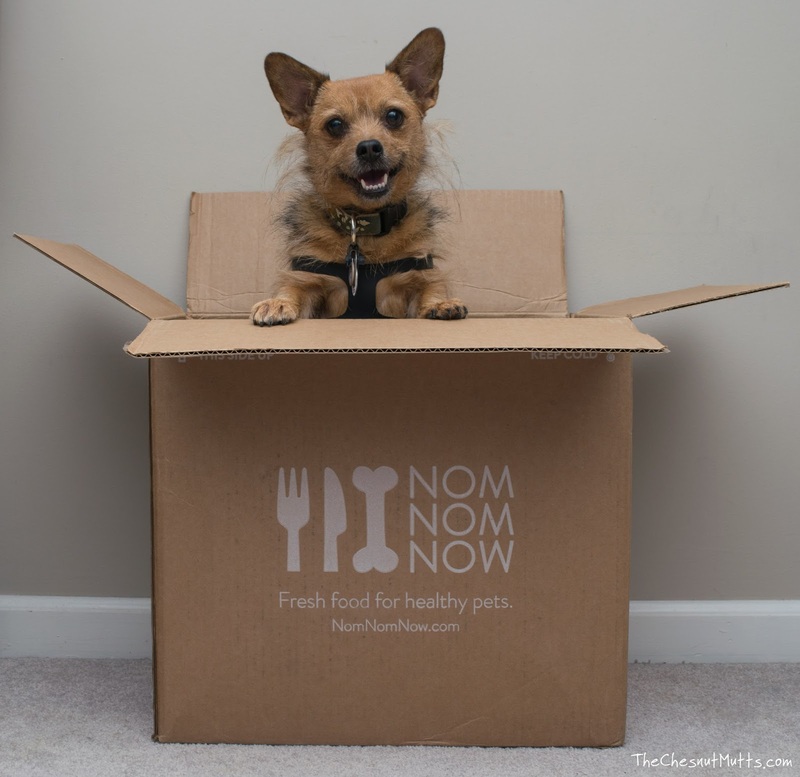 NomNomNow ships their food to all of the 48 continuous U.S. states on a monthly subscription. If you live in certain Western states you can choose weekly instead of monthly. We received a month's worth of food for both Jada and Bailey. Let's just say I had to clear some room in the freezer! 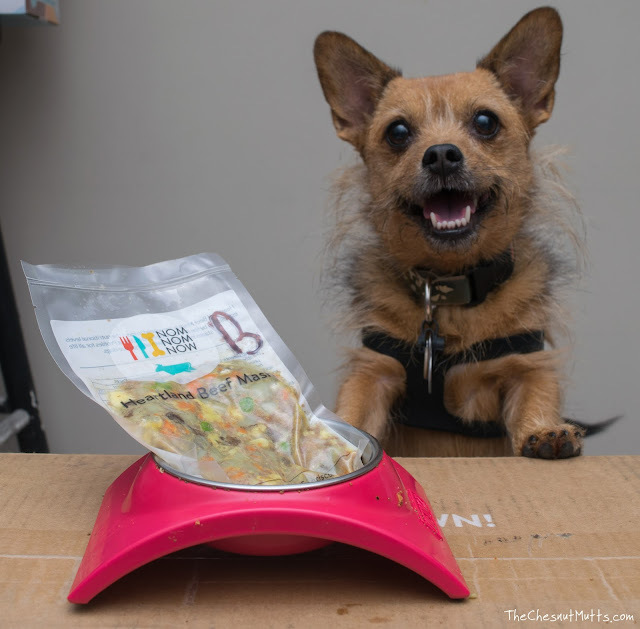 Each meal comes in their own little vacuum-sealed packet which is weighed to the gram to make sure your dog gets the right amount of food. Also, transition meals are included to mix with your current food, as completely switching foods can upset your pup's tummy. Since we have two dogs, the company marked "J" for Jada and "B" for Bailey, which is absolutely adorable. We got Jada a tofu-based food and Bailey got a beef-based food. When I met NomNomNow at Blogpaws, I mentioned how Bailey is a very particular eater. "NomNomNow is not afraid of picky eaters!" I was told. Since the food came fresh instead of frozen, we were able to dig in right away. Let's take a closer look! This is the Egg & Veggie Medley that Jada munched on happily for a month. 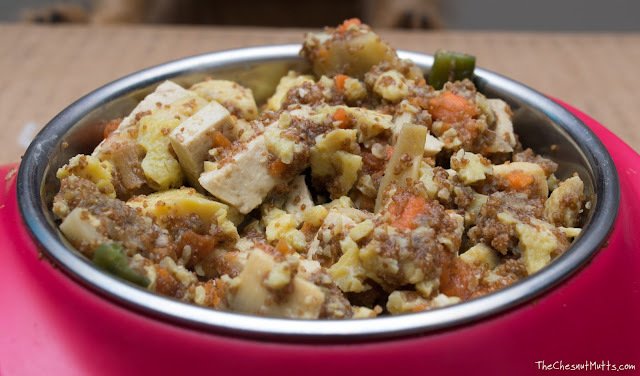 This recipe has many healthy ingredients: Eggs, Firm Tofu, Teff (the edible seeds from Teff Grass), Carrots, Green Beans, Dried Mulberries, Bamboo Shoots, Chia Seeds, Coconut Oil, and the NomNomNutrient Mix which is a combination of various nutrients. Jada is not the definition of a picky dog, but she does have varying levels of excitement for food. 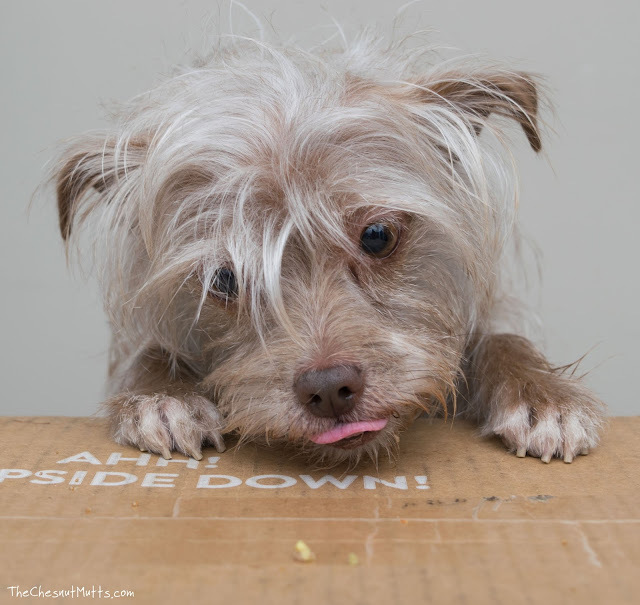 NomNomNow gets her jumping, barking, and whining for her breakfast and dinner! I chose the tofu recipe because it is one protein source she hasn't tried and I thought maybe with her allergies she could benefit. We didn't have spectacular results of an itch-free Jada; however, she is an advanced case. "Excuse me! Do not block my noms!" I have to admit, these dishes are very pretty. Just look how hearty they look! One thing we would have to change if we got another order of NomNomNow is the portion size for Jada. It is perfect for her size, but she puts on weight very easily and has to eat as much as Bailey who is 4 pounds lighter. This is actually an easy fix since NomNomNow is customer friendly. They actually called me because I forgot to put Jada's age in her bio. Talk about customer service! 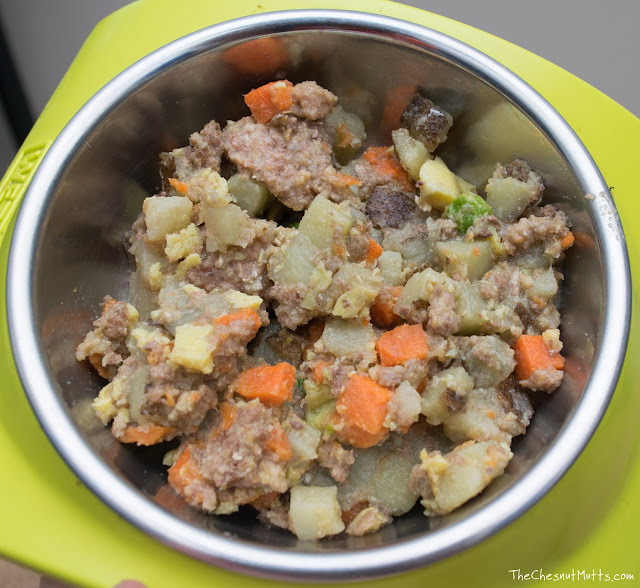 Bailey was able to try the Heartland Beef Mash which includes down-to-earth ingredients: Ground Beef, Potatoes, Carrots, Peas, Eggs, the NomNomNow Nutrient Mix, and Fish Oil. I decided on a traditional recipe because she is that type of dog who loves human food (thanks, Pop Pop). This definitely fits the bill! As you can see, Bailey loves NomNomNow! She didn't stick her nose up the whole time she ate her Heartland Beef Mash, which is amazing. She seems to get bored of food really easily, but every day she was super excited! I just love that each meal is fresh and cooked to order; the recipes have no additives or artificial ingredients and are human-grade. 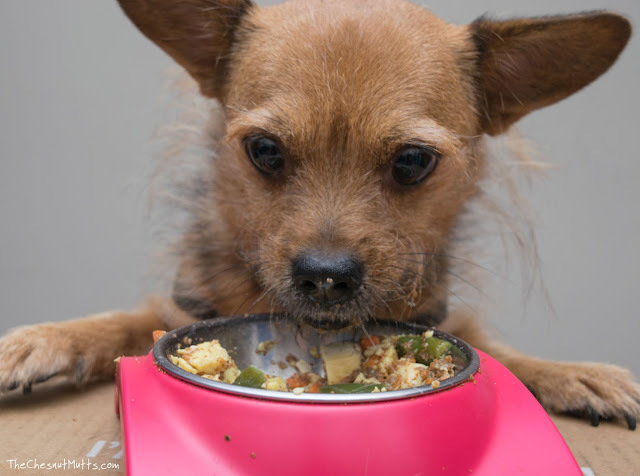 NomNomNow only uses U.S.A. ingredients in their FDA-compliant fresh dog food kitchen in the San Francisco Bay area! The packets are genius. Once we got our box, I took the transition meals and put some of them in the fridge, then the rest were placed in the freezer. They are easy to open (Jada's did require scissors, but it is a new recipe, so I am sure they are rolling out the new packets soon) and it takes about a day and a half to defrost; so as you take food out of the fridge make sure you replenish it! 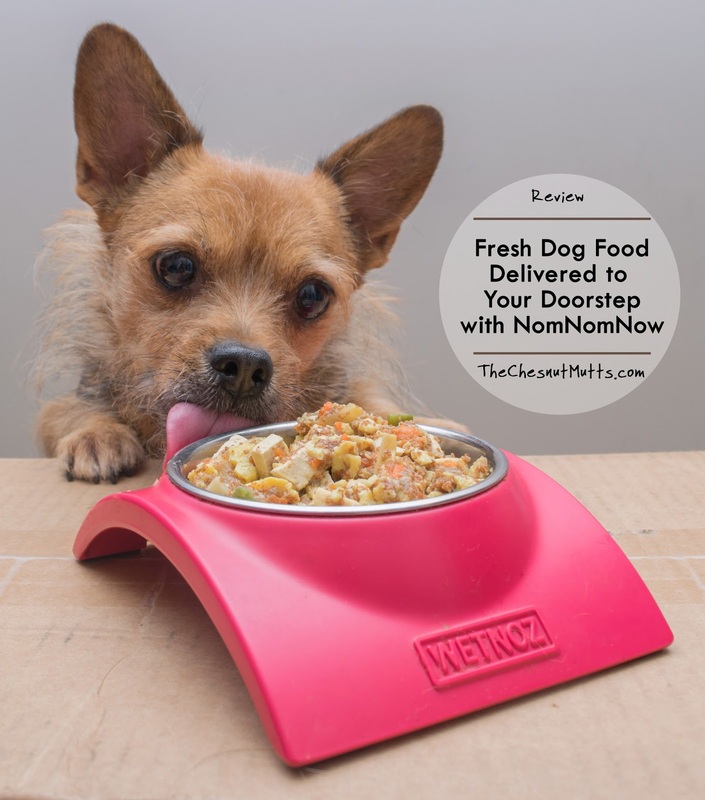 NomNomNow can keep up to 6 months in the freezer, so there isn't any rush if you need to transition longer or if you rotate your dog's meals. I also thought it would be difficult to squeeze the food out of the bag, but it was actually very easy - no squeeze was required! Price-wise, it can get expensive. 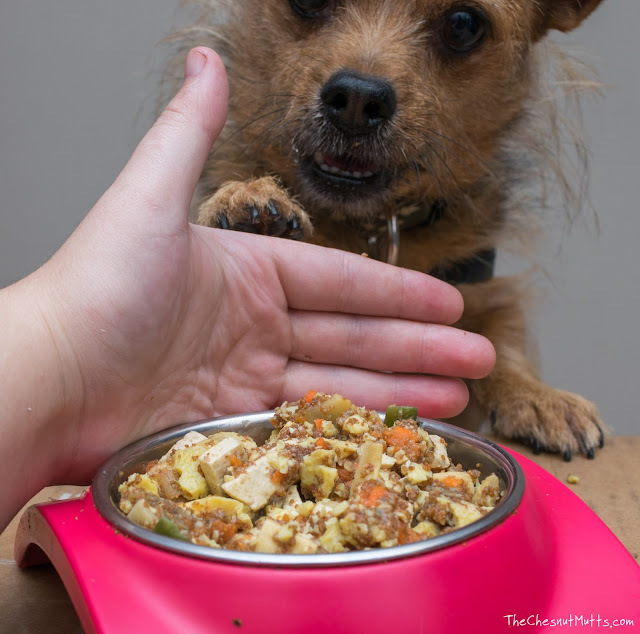 It all depends on the recipe you select and your dog's age, weight, and activity level. For an average 32 pound dog, you could pay around $38 per week. You can order NomNomNow online at their website. When you use our code "Chesnut52" you will receive 50% off your first two orders! I think NomNomNow is a fantastic company. 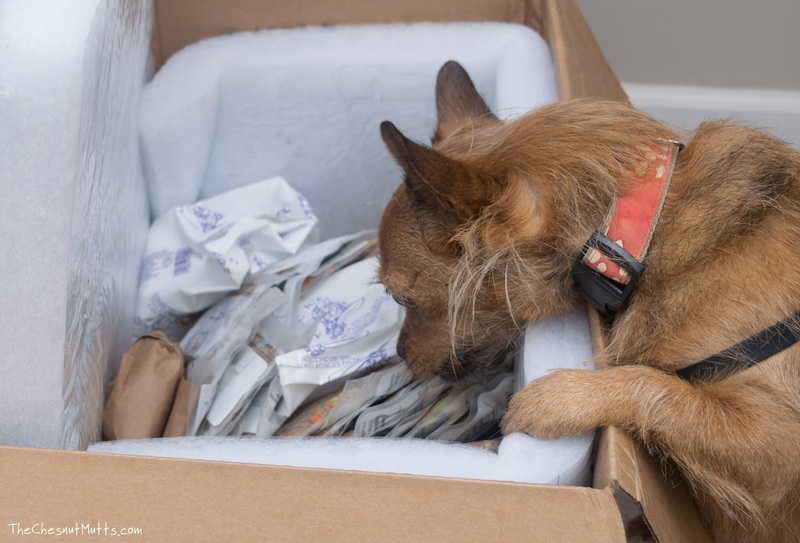 This a wonderful idea - combining better nutrition for our pets as well as making it easy by having it delivered! My girls loved the food, especially Bailey! I am pretty sure she thought she was getting our leftovers or something. So, this is picky dog approved! The big issue is the price, of course. 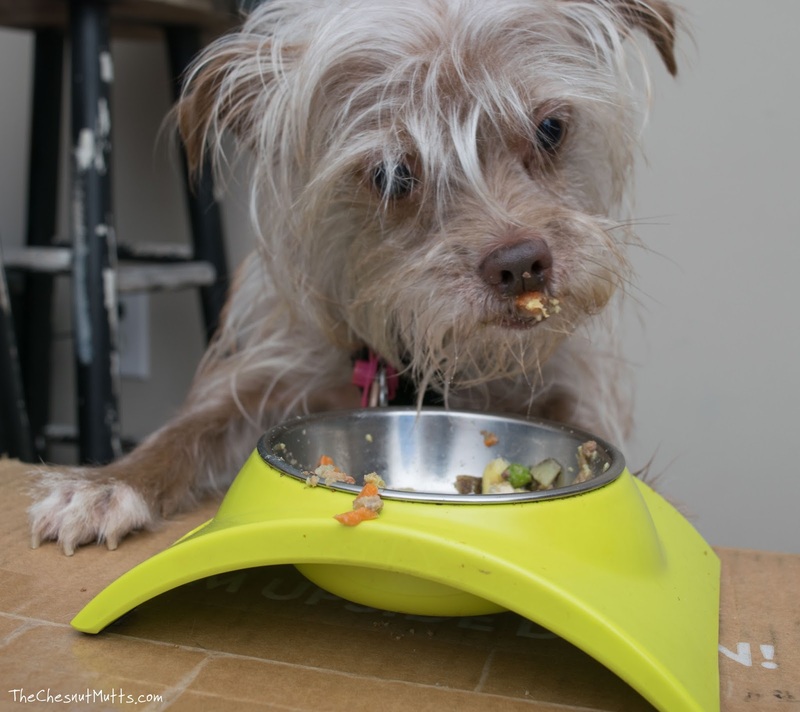 All dogs can be fed NomNomNow, but I would highly recommend it to pet parents of small dogs who are extremely picky or have severe health problems who would benefit from a fresh diet. We really like NomNomNow and would definitely feed again! What do you think? 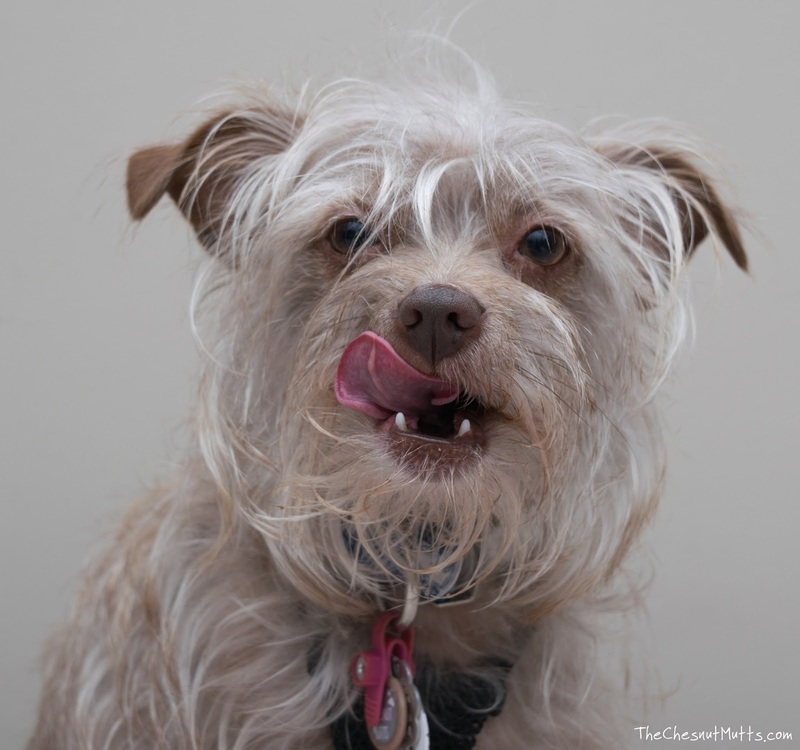 Would you feed your dog NomNomNow? For the dog training, you must have to find the best authentic source like this https://dogpeer.com.au website from where you can get the world’s top training expert for your dog training. Jokowi said the development of technology is moving so fast that people must continue to learn. He stated that Mobile Legends could be a lucrative source of income for those who work on it. One of the young people who took advantage of the opportunity was the e-Sport player and a Mobile Legend gamer, Jess No Limit. Dengan memanfaatkan sebaik mungkin Internet khususnya akses Judi Online Anda dapat dengan mudah mendapatkan Income langsung dan Passive Income bonus dengan sangat mudah. Mari bergabung dengan kami di SITUS JUDI ONLINE DENGAN JUDI BOLA SBOBET DAN JUDI SLOT TERPERCAYA. Kami akan menjamin segalanya untuk kenyaman para pemain dan akan membantu untuk memperoleh keuntungan berlipat dan tiada habisnya.